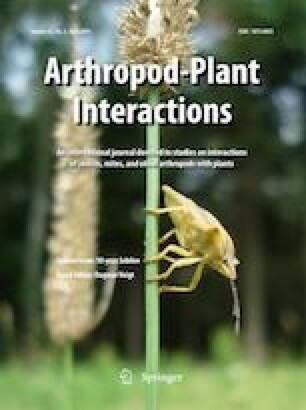 More than 10 years ago, while studying mirid bug locomotion and attachment on diverse plant surfaces, and wondering where to publish such a cross-over complex approach, Arthropod-Plant Interactions (APIS) had been launched (Hokkanen 2007). This Journal appeared to fit best, and much encouraged the finalization of an extensive, meaningful manuscript. What an honor and pleasure to publish my first international peer-reviewed research article in the first volume of APIS, reaching a wide, interested, and continuously growing readership! Meanwhile, APIS is well established with 13 volumes and 61 issues, including two virtual issues focusing on the cutting-edge topics ‘Pollination Ecology’ and ‘Microbe-mediated Arthropod-Plant Interactions’, as well as the Special Issues ‘Bees and flowers, an old love story’ and ‘Ecology and Control of the Pollen Beetle’. Since 2007, more than 680 articles have been published, and this number is increasing year by year. Congratulations to the Publisher and the team of Editors, in particular to the Editor-in-Chief and the Managing Editor, who patiently and powerfully processed numerous contributions and administrative business during this long period of time! 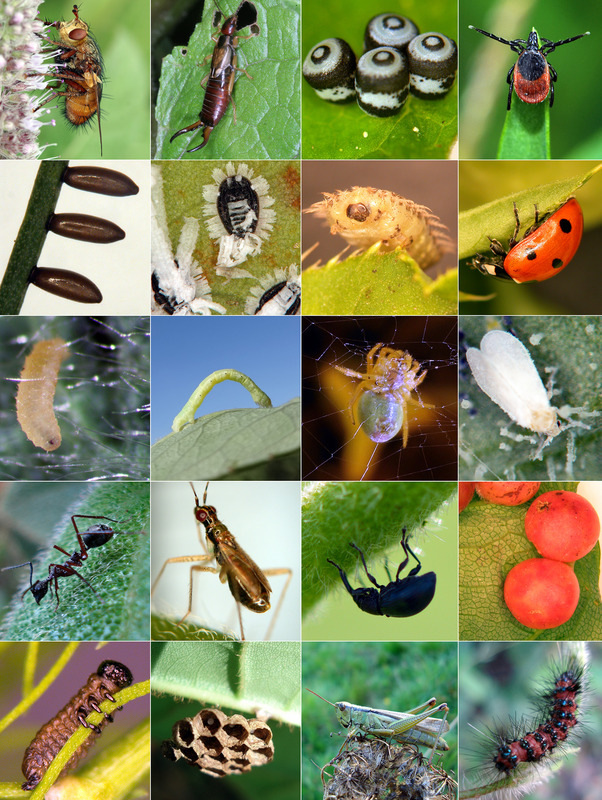 Thanks to their enthusiasm, APIS provides a unique, reputable, international publication platform and interface for experienced and young experts, who explore arthropod-plant interactions from various perspectives, including fundamental and applied research in different fields, such as (co)evolution, pollination, chemical ecology, plant defense, biomechanics, or a combination of fields, across groups of arthropods and plants, across habitats, trophic levels, and developmental stages (Figs. 1, 2). Methodology, assays, experiments, scenarios, reviews, and critical forum papers are considered as well. The diversity of APIS contents and complex backgrounds is reflected in the contributions to this APIS 10-Year Jubilee special issue. They match pollination (Carneiro et al. 2019; Sabino et al. 2019), tripartite interactions (Pan et al. 2019; Zheng et al. 2019), microbe-mediated interactions (Pan et al. 2019), biochemistry (Danielsson et al. 2019; Guo and Wang 2019; Mofikoya et al. 2019; Zheng et al. 2019), behavioral assays (Gorb and Gorb 2019; Guo and Wang 2019; Yip et al. 2019), plant defense (Grover et al. 2019; Kariyat et al. 2019; Yip et al. 2019), plant genetics/resistance (Grover et al. 2019), structural aspects of arthropod-plant interactions (Gorb and Gorb 2019; Kariyat et al. 2019; Voigt et al. 2019), oviposition (Jones et al. 2019; Voigt et al. 2019; Williams III et al. 2019), larval development (Kariyat et al. 2019), applied approaches (Danielsson et al. 2019; Grover et al. 2019; Kariyat et al. 2019; Mofikoya et al. 2019; Pan et al. 2019; Voigt et al. 2019; Williams III et al. 2019; Zheng et al. 2019), methodological approaches (Danielsson et al. 2019; Mofikoya et al. 2019), and surveys/reviews (Jones et al. 2019; Mofikoya et al. 2019; Zemenick et al. 2019). The multiple assignments of above references underline the integrative and multidisciplinary nature of APIS articles. They transcend boundaries and exceed conventional, predominant aspects by the smart linkage between study methods and concepts. Thus, e.g., signalling networks meet structure–function dynamics, biochemistry meets biophysics, etc. One particularity of APIS is the support of comprehensive studies which adequately elaborate complex, dynamic arthropod-plant interactions. This is in contrast to the current trend of high-speed, short-cut, highlight-oriented publishing, mostly missing details of cross-linked backgrounds, which are, however, essential for a coherent consideration of the multifaceted relationships in ecological frameworks. 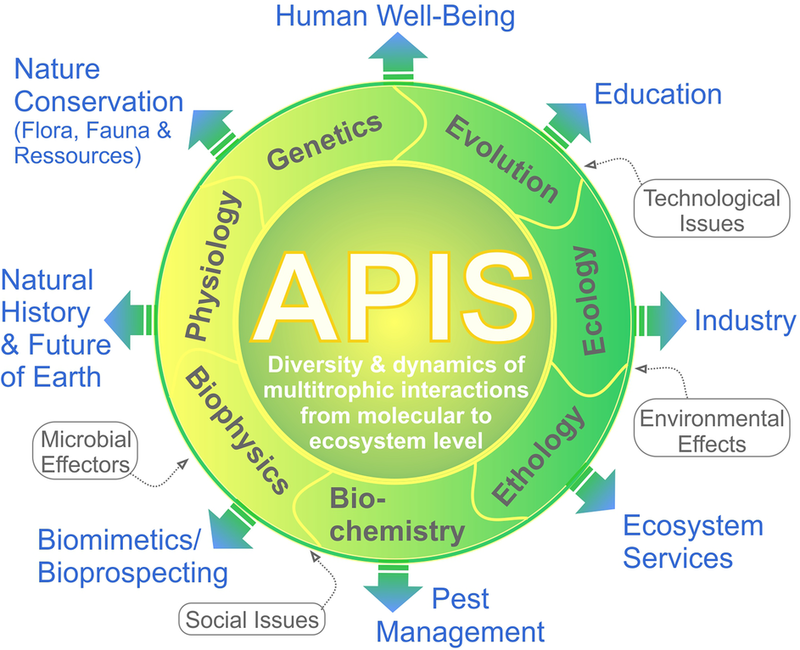 Similar to the diversity of integrated research disciplines, the outcome of APIS meets various sectors, such as nature conservation, eco-service, pest control, etc., and thus, a broad readership and multiple recipients (Fig. 1). Actually, APIS seems to be ahead of the times: while recent works in other journals merely raise public interest for the loss of species, APIS articles focus on complex, multilevel biotic and abiotic interactions of organisms, which definitely matter for sustainable species conservation in their diverse natural environment. Against this background, all species are of value, which is emphasized by the conscious consideration of both insects and arachnids in the journal title and subjects of APIS. Knowing that more than two-thirds of insects (arthropods) are associated with plants at least during part of their life (Zwölfer 2003), a large number of multiple arthropod-plant interactions and new perspectives remain to be discovered and considered in APIS. For this future mission, my best wishes to the enthusiastic editorial team and stimulated authors towards the attraction of inquisitive readers, sustainable impact, and much more public interest, including press and media. Sincere thanks to the colleagues, who contributed their articles to this SI and to the numerous reviewers who constructively commented on the manuscripts! Surely, the multifarious APIS 10 Year Jubilee special issue will be enjoyable, sharing the passion for arthropod-plant interactions, and encourage the future publication of fascinating topics in APIS for more than the next 10 years! I would like to thank Professor Dr. Heikki Hokkanen and Dr. Ingeborg Menzler-Hokkanen (APIS Editor-in-Chief and Managing editor; University of Helsinki, Finland) for inviting me to take over the guest editorship for this SI. My contribution to the SI was partially funded by tax money based on the household budget (TG70) confirmed by delegates of the Saxonian parliament and by Equal Opportunity Support of the School of Science at the Technische Universität of Dresden, Dresden, Germany.